In our final episode, Brian and Jack get to close things out with an exclusive in-depth “exit interview” (or is that exit Gwenterview?) with Spider-Gwen’s writer and co-creator Jason Latour! In a conversation that mirrors the spirit of the book, we dig into some big ideas while simultaneously going in all kinds of directions. We talk about Spider-Gwen’s spirit of risk, the power of consequence, and how the series continually defied expectations as part of a unique and personal search for the truth. We unpack the ideas of the series finale, discuss the Spider-Verse trailer and consider where Gwen could go next. We learn more about the upcoming “Spider-Ben” story, get clues about the lost Earth-65 books (!) and hints about Jason’s next project for Marvel. There’s even time for quantum physics and of course, for corn dogs. Be sure to stick around after the interview, as Jack and Brian offer some final thoughts, share some reflections from our listeners, and bid a fond farewell to Ultimate Spin. THANK YOU for listening and for your support over the years! It’s been a blast! 2:28 – In Conversation with Jason Latour: Digging into Spider-Gwen’s themes of Great Power and Great Accountability to find a different take on the Spider-Man mythos. Wearing the mask releases your inhibitions, but then you have to wrestle with the consequences of those inhibitions not being present. Letting go of the fear of failure while in pursuit of the truth. Embracing the craziness of comic books and recapturing the Saturday Morning Cartoon vibe. Considering the finale and looking to the future. Our sincere thanks to Jason for taking the time out of his busy schedule to chat with us! This is it! Brian and Jack reflect on the passing of Gwen’s co-creator Steve Ditko, consider the latest casting announcement for the Spider-Verse film, and take a closer look at Spider-Gwen #34, reflecting on how the series finale ties its themes together with a layered heart-to-heart between our hero and *her* hero. 7:35 – Spider-Gwen #34 – After playing a marathon rock concert, Team Spider-Gwen unplugs to close the show with a thoughtful acoustic number. Miles’ finale similarities. The payoff of the long-awaited Stacy reunion. Owning your identity when life redefines it for you (and keeping yourself honest). Ideas we’d have liked to liked to have seen more of. Our personal high points (and not-as-high points) for the overall series. 40:22 – Our three word summaries of the series. 42:06 – Outro; What did *you* think of the series finale? Let us know! And coming up…what’s in store for Episode 100? Join the Amazing Spider-Slack! From our friends at the Amazing Spider-Talk podcast! Jack’s website; Podcasts: The Super 8-Bit Power Hour; Four-Colour Corner; The Sequelisers! In this episode, it seems to be darkest before the dawn as Brian and Jack take a closer look at the harsh and risky penultimate chapter of the saga in Spider-Gwen #33. 0:00 – Intro; Catching up with recent Miles and Gwen-related news. What the movie could mean for other Spider-Heroes. New stuff to pick up and new titles on the way from the creative team! 15:17 – Spider-Gwen #33 – Harsh, relentless, brutal (thank goodness for the lighter bookends). A powerful cover sets the tone for the darkest chapter yet. Navigating transitions and figuring out Gwen’s plan. Speculating on how this could all end (we have no idea). Robbi Rodriguez relaunches DC Vertigo with Goddess Mode! Coming soon in Spider-Geddon: Spider-Ben! How big are those pythons? In this episode, Brian and Jack ponder honesty vs. truth as the confrontation with the Kingpin comes to a head in the complex and stunning Spider-Gwen #32. We also catch up with Miles’ recent appearances in other titles and OHMYGODDIDYOUSEETHESPIDERVERSETRAILER?!?!?!?!? 7:09 – Into The Spider-Verse trailer reaction! 16:36 – Spider-Gwen #32 – A dense issue with a lot to unpack! Honesty vs. Truth. Gwen Stacy and her awesome speeches. The long game for Gwen’s well-earned victory. Jack rants about one line of dialogue. Farewell to the Kingpin? What happens next? 51:46 – Our three word summaries of the issue. Jack’s website; Podcasts: The Sequelisers! In this episode, Brian and Jack are joined by Superior Spider-Talk‘s Dan Gvozden to discuss the surprising series finale that is Spider-Man #240. We share your thoughts and reflections on Miles’ series, and we have a major announcement about the future of the podcast. All kinds of feelings in this episode! 0:00 – Flashback: Bendis on Miles’ first true villain. 1:53 – Intro; Welcome back, Dan! 5:32 – Spider-Man #240 – A terrifying real-life moment informs the final chapter of a nearly two decade run. But does it work in context? Looking at how Bendis cleared the decks for the next creative team (a way to potentially lose the new powers? Jefferson’s new last name?). Not the best ending, but perhaps the best one possible? Looking back on Miles’ story and our favorite moments. 49:45 – Our three word summaries of the issue. 50:49 – Listener feedback! Your thoughts on this issue and reflections on the series. 57:32 – A big announcement about the Ultimate Spin podcast. Listener Lawrence Minor’s Spotify playlist for Miles! In this episode, Brian and Jack try to unpack a particularly complicated chapter in Spider-Gwen #31. Plus, some major news about the series. 0:00 – Intro; Sad but true: The end of Spider-Gwen (for now). 3:55 – Spider-Gwen #31 – Unpacking the pieces of a complex puzzle. Owning your destiny and the true link between Gwen 617 and Gwen 65. Change can be scary, but it can also be worthwhile. Commentary on the state of comics and the sun literally setting on one of our favorite series. 30:23 – Our three word summaries of the issue. It’s official: Spider-Gwen is ending! In this episode, Brian and Jack take a closer look at the chaotic penultimate issue of Bendis’ run in Spider-Man #239. Plus, we discuss the news that the Ultimate Universe is returning! 0:00 – Intro; Wait, the Ultimate Universe is really coming back? How things could be different this time. 5:24 – Spider-Man #239 – Mask on, Mask off. Dialogue disaster. Squandered Sandman. So many strands of this web…but does anything connect? Surprises at the end…but why? How (Can?) this all be pulled together for the finale? Looking at other reviews. 28:36 – Our three word summaries of the issue. In this episode, Brian and Jack address the latest rumors about Miles’ future and then take a closer look at Spider-Gwen #30, which kicks off a new arc called “The Life of Gwen Stacy”! 0:00 – Intro. Miles isn’t going anywhere, don’t worry. 5:03 – Spider-Gwen #30 – The Life of Gwen Stacy. The beginning of the end? Robbi’s Romita and having fun with the past. A different kind of team-up. A story worth (re)-reading. Quantum Mechanics With Jack (Is this whole thing really The Watchers’ fault?). The shock ending! 30:22 – Our three word summaries of the issue. Source of John Romita cameo! CBR: No, Miles has not been canceled. Introducing the Untold Talks of Spider-Man podcast! Haven’t read them yet? Pick up these issues today at Comixology! In this episode, Brian and Jack take a closer look as all hell breaks loose for Gwen and her arch-enemy in Spider-Gwen #29! Then the Sinister Six *FINALLY* puts their plan into action in Spider-Man #238! 0:00 – Intro. Spider-Man colorist Justin Ponsor needs our help! 4:47 – Spider-Gwen #29 – Two guys discuss a story about two guys discussing a story about Spider-Gwen. An extended fight sequence that packs as many emotional punches as it does physical ones. Considering a conversation all the way back in issue 3 and wondering what the future might hold for The Life of Gwen Stacy. 20:11 – Our three word summaries of the issue. 20:34 – Spider-Man #238 – The Sinister Six (Seven) finally have their moment! 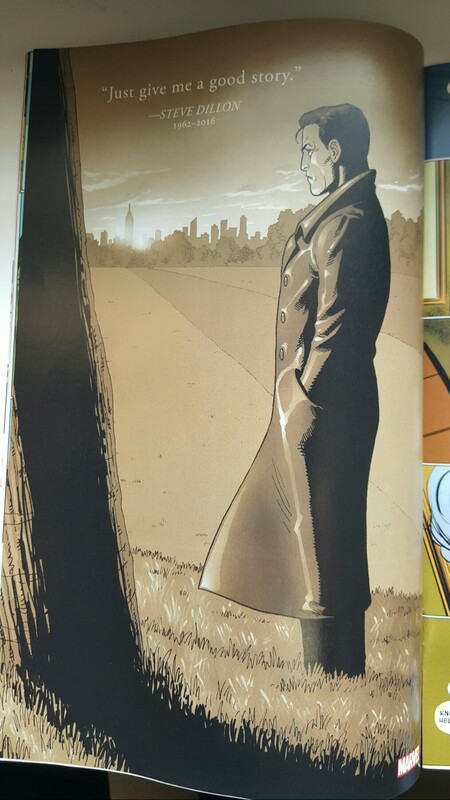 Sandman as moral compass. Spidey saves the day (sort of). The non-drama of Barbara’s discovery. An underwhelming arc, but trying to appreciate the bigger picture. Feeling fatigued with playing it safe. 38:37 – Our three word summaries of the issue and Listener Feedback. GOFUNDME DRIVE FOR JUSTIN PONSOR – PLEASE READ! We’re back! In this bumper episode, Brian and Jack get into all kinds of truth as we discover the origin of our favorite villain The Kingpin in Spider-Gwen #28! Then it’s a family affair as things get complicated for Miles in Spider-Man #237. We’ll also share some of your listener feedback and check in with the news about what’s next for Miles’ *other* series, Champions! 2:32 – Spider-Gwen #28 – A story about two sides of the same coin…and being punched in the face by the truth. Matt and Gwen: Kylo and Rey? Considering three of the most powerful panels in the entire series. Uncle Ben-65’s take on Power and Responsibility. Jack’s head is ready to explode. 18:39 – Our three word summaries of the issue and Listener Feedback. 21:37 – All change for the Champions: Maybe something we’ll check out? Plus a brief ASMR confession. 26:24 – Spider-Man #237 – Pancakes! A successful arc for Rio. The Bombshells drama takes an uncomfortable turn. An out-of-place (out-of order?) moment with Hobgoblin. Jefferson vs. Aaron and how that could lead to Miles becoming Spy-D.
47:35 – Our three word summaries of the issue and Listener Feedback. Did Uncle Aaron learn about post-battle pancakes from Prince? In this episode, Brian and Jack begin the countdown of Bendis’ final issues and look at the explosive confrontations in Spider-Man #236. Plus, we catch up on the rumor that Miles may no longer be Spider-Man and share your feedback on this development and the latest chapter! 0:00 – Intro; Miles has a new name? Our take (and yours!) on “Spy-D”. 6:31 – Spider-Man #236 – Three issues into the arc: What happened to the Sinister Six? More of Miles’ new power. Poor Ganke! Taking stock of the various elements and wondering if and how we’ll see them resolved. Cliffhangers and diminishing returns. Where can this go next…or are we biding our time before a relaunch? 28:00 – Our three word summaries of the issue. Sy-Fy: Is Miles getting a new code-name? For Sandman and the others their betrayal isn’t personal. It’s just business. In this episode, Brian and Jack welcome Superior Spider-Talk’s Jaleh Najafali back to the show to discuss a noir-style turn for the Gwenom arc and its implications for our hero and her family in Spider-Gwen #27! 2:28 – Spider-Gwen #27 – Guest artists Veronica Fish and Olivia Margraf capture the spirit of the series, seamlessly anchored by the colors of Rico Renzi; An interesting parallel between George and Ben. Can anyone even come close to Matt as a villain? Gwen as a proactive vs. reactive character. A wild card theory about Ben’s future. 21:01 – Our three word summaries of the issue. In this episode, Jack and Brian look at the Sinister Six closing in while things take an unexpected turn for Miles in Spider-Man #235! Plus, movie news for both Miles *and* Gwen (including a breaking news update to react to the new Spider-Verse trailer)! We also share your listener feedback & soundtrack suggestions, and announce the winner of a digital copy of Spider-Man Homecoming! 17:37 – Spider-Man #235 – Wait, what happened to the Sinister Six’s big heist? Debating Miles’ new power. Art and color don’t seem to sync up. Miles getting out of the game…only for Lana to pull him back in. Does Miles appreciate Ganke? 36:55 – Our three-word summaries of this issue. 37:33 – Listener question: Is there anyone that we *don’t* want to write for Miles? 42:11 – Listener-suggested playlist for Spider-Man #235 (see below). 43:58 – Contest winner! Did you score a digital copy of Spider-Man Homecoming? Get well soon, Mr. Bendis! Movie trailers for both Miles and Gwen! In this episode, Brian welcomes back The Marvel Report’s Breeze Riley to discuss the Gwenom arc’s themes of love and loneliness in Spider-Gwen #26! 0:00 – A brief but important PSA. 5:14 – Spider-Gwen #26 – A surprising turn from a villain is the heart of a raw and moving story about facing your fears. The crushing weight of loneliness and not being able to see those who want to help. Power and Responsibility as a burden – helping everyone else at your own expense. Strong acting and the beautiful use of black. Musing on the potential future spinoffs. 23:34 – Our three word summaries of the issue. In this episode, Brian and Jack are joined by Black Nerd Problems’ Omar Holmon and Amazing Spider-Talk’s Dan Gvozden to process the news that Miles’ creator Brian Michael Bendis is moving on from the book and Marvel Comics altogether. What happens next and could it be good for everyone involved, especially considering that Marvel has a new Editor-In-Chief as well? We also try to come to terms with Part 4 of the difficult slow burn that’s been Spider-Men II. 2:00 – Bendis is leaving?! We put up a wishlist on potential new voices for characters like Miles and Riri, as well as characters that we’d love Bendis to give voice to in his new role at DC (and not just in the comic books). Will the editorial style change as well? 26:36 – Spider-Men II #4 – We’re heading into the home stretch, but the pieces sadly haven’t clicked together. Shouldn’t the “alt-Miles” be more interesting beyond his name? Is the surprise ending too little, too late…or too soon? Why the “power and responsibility” conversation fell flat. Was there enough of an idea for five issues? What’s the deal with Barbara? 44:26 – We skip the three word summaries this time in favor of the Black Nerd Problems rating system! Defenders #7 – what could it mean for Miles? In this episode, Jack and Brian take a look at the drama and surprises in Spider-Man #234! Lots of plot points to keep track of, but is everything balanced successfully? Plus, your listener feedback and a chance to win a digital copy of Spider-Man Homecoming! 0:00 – Intro; How did we jump to from #21 to #234? 4:21 – Spider-Man #234 – HE’S BACK. What could this mean for Miles and his family? Jack has a grim prediction. The family ties that bind for more than one of our heroes. Silent Heroism. Is Barbara’s new status a disservice to her character? Great high school drama, but too compressed? 24:45 – Our three-word summaries of this issue. 26:10 – Your feedback on this issue. 33:00 – Listener-suggested soundtrack picks for Spider-Man #234 (see below). Brian covers Run The Jewels (really). 35:54 – CONTEST! Think of a new name for The Sinister Six and win a digital copy of Spider-Man Homecoming! Episode 69: In Conversation with Spider-Gwen artist and co-creator Robbi Rodriguez! In this special bonus episode, Brian and Jack got some time to catch up with Spider-Gwen artist and co-creator (and good friend of our show) ROBBI RODRIGUEZ to take a closer “creator commentary” look at the long road to the current Gwenom arc, its themes of burden, loss, and loneliness, and what it could mean for the character going forward. Yeah, it’s dark stuff, and our conversation gets a little heavy in places, but there are some laughs to help keep things balanced as we go behind the scenes of issues 7-25. Brian and Jack welcome Superior Spider-Talk’s Jaleh Najafali back to the show to discuss the long awaited debut of the Gwenom arc in Spider-Gwen #25! 0:00 – Intro – Welcome back, Jaleh! 2:50 – Spider-Gwen #25 – This long awaited issue skillfully balances darkness and light and delivers a fresh take on Venom. Marvel Legacy and using four recaps in one issue (no matter how great they are, cover songs rarely outshine the original). Dizzying fight sequence and Frank steals Gwen’s moment. Is anyone not crushing on Matt Murderdock? Quiet heartbreak and the power of color. 24:36 – Our three-word summaries of this issue. Miles’ Japanese adventure concludes and Jack and Brian consider what it means for the future as they discuss the spectacular Spider-Man #21! 1:44 – Spider-Man #21 – The cover needs to be an animated series. Things heat up for Miles & Tomoe. Aaron wasn’t all that bad. Jefferson is Super Dad. The magic of Jackie Chan and we disagree about the fight resolution. DAD JOKE WARNING: What could this series be called if Miles hangs up the webs? 18:47 – Listener Feedback: Thoughts on this issue, the Bendis-Verse, and Kyle’s return (sort of). 26:17 – Our three-word summaries of this issue. 21:19 – A listener offers including soundtrack picks for Spider-Man #21 (see below) and Jack tries to avoid copyright strikes. And if you really want it, the version by Bruce Willis (really). In this episode, Jack and Brian welcome back Superior Spider-Talk‘s Dan Gvozden for an extended episode as we travel back in time with one version of Miles in Part 3 of Spider-Men II and another in Generations: The Spiders! 1:57 – Spider-Men II #3 – Are we in for an extended run? Introducing the Kingpin, but what about Evil Miles? Considering plot mechanics and the series format. What is it all leading to? Too violent? 36:15 – Generations: The Spiders – A beautifully rendered Ditko homage that’s more Spider-Men than Spider-Men II? Digging deeper into the question of identity. If Peter is so Amazing, then where can (should) Miles go from here? And is it all part of a larger plan? In this episode, Brian and Jack catch up with an unusual turn of events for Miles as he heads to Japan in Spider-Man #20! 0:00 – Intro: Slight confusion over the cover story. 2:56 – Spider-Man #20 – Taking a vacation; A familiar plot framework; The “Bendis-Verse” makes for more satisfying crossovers; Stunning artwork (that tiny Miles over Tokyo! ); Clever scripting makes for an entertaining fight sequence; Cliffhanger hopes and preferring the unknown over the familiar. 21:19 – Jack raises the bar on our three-word summaries of Spider-Man #20. In this episode, Brian and Jack take a break from the “Predators” arc and check out a night in the life of Spider-Gwen’s band The Mary Janes, as they take the spotlight in Spider-Gwen #23! 2:08 – Spider-Gwen #23 – GWENOM has arrived! So it’s a perfect time to switch gears for a story about Gwen’s band. Fortunately, the change of pace (and creative team!) manages to be all kinds of awesome. A fresh take highlights the trickier parts of friendship, dealing with “nice guys”, and finishes loud, proud, and strong. Episode 62: Interview with Miles Morales author Jason Reynolds! We’re very proud to bring you this exclusive interview with award winning author JASON REYNOLDS, writer of the New York Times bestselling novel Miles Morales: Spider-Man! This was such an interesting and wide-ranging conversation with a talented and generous writer. We hope that you enjoy this interview! MAJOR THANKS to Jason for taking the time out of his busy schedule to chat with us! In this episode, Jack and Brian take a closer look at Spider-Men II #2 and are disappointed to find that they’re already losing interest in the miniseries. What went wrong and more importantly, can this train get back on track? 3:35 – Spider-Men II #2 – The miniseries takes a disappointing stumble and we try to figure out what happened (and why). Jessica Jones stops by to promote her new series. Miles quits…again. Would this be better read as a trade? Trying to reconcile street-level Miles w/ inter-dimensional adventurer Miles. Shouldn’t Evil Miles be a bigger deal? 19:01 – Our three-word reactions to Spider-Men II #2. 21:05 – Outro; Listener feedback; What did *you* think of this issue? Let us know! Jack’s website; Jack’s new (and noteworthy) podcast: The Sequelisers! In this episode, Brian, Kyle, and Jack welcome Superior Spider-Talk’s Dan Gvozden to discuss the long-awaited Spider-Men II #1. After five years and a radically different Marvel landscape, is it too late for this sequel? Why is there suddenly tension between Peter and Miles (and Jack and Kyle)? Plus, your thoughts on this issue! 0:00 – Intro; Dan tells us more about the relaunch of the Amazing Spider-Talk podcast. 4:16 – Spider-Men II #1 – Untangling the post-Secret Wars continuity mess. Peter Parker, you are a jerk! Miles’ legitimacy as Spider-Man is questioned (again). A brief throwback to classic Ultimate-style storytelling. Art highlights and our theories on Mr. Morales. 42:13 – Our three-word summaries of Spider-Men II #1 and your thoughts on this issue! 48:09 – Tensions simmering as our outro section is reaching boiling point. What did *you* think of this issue? Let us know! In this episode, Brian, Kyle, and Jack take a closer look at the dramatic (and welcome!) tonal shift of Spider-Man #17 and consider the implications for Miles as a character. 2:23 – Spider-Man #17 – Cover Talk (the challenge of limited solicit info). Is it already over for Bombshell? The soft side of Hammerhead. Miles sails The Sea of Darkness. Becoming a proactive character. The best cliffhanger in the series so far (and our concerns for its resolution). 28:00 – Outro. What did *you* think of this issue? Let us know! Spider-Man and his Amazing Friends! In this episode, Kyle returns and joins Brian to discuss Spider-Gwen #20, an issue that’s packed to bursting point with action and a twisting plot that keeps us guessing. 2:06 – Spider-Gwen #20 – “Predators: Part 2!” The debut of Earth-65 Wolverine is nearly overSHADOWed. Navigating the push and pull of fast-paced art and storytelling that requires close attention. What is Matt’s plan? 16:00 – Outro. What did *you* think of this issue? Let us know! Episode 50.1: Interview with Brian Michael Bendis! While it’s been a generally enjoyable crossover so far, Jack and Brian feel the need to dial back their expectations as they take a closer (and short!) look at Spider-Man #14. 1:21 – Spider-Man #14 – That logo! Looking for momentum. Character moments vs. dimension hopping. Missed opportunity? Great voices for characters. The ding mystery? 15:33 – Outro. What did *you* think of this issue (and Gwen and Miles getting together)? Let us know! In this episode, Brian, Jack, and Kyle jump back to Earth-616 to keep up with our new Spider-Couple in Spider-Gwen #17! Plus, your feedback! 1:41 – Spider-Gwen #17 – Framing the story vs. telling it. A focus on character vs. spectacle (similar to 2016’s Spider-Women crossover). A third wheel on a second date? Our heroes unmasking: Scripting or Artistic call? Despite the initial fan reaction, is the whole “romance angle” despite fan reaction much ado about nothing? 21:46 – Outro. What did *you* think of this issue (and Gwen and Miles getting together)? Let us know! In this episode, Brian, Kyle, and Jack share an interesting Brian Michael Bendis Q&A excerpt about Miles’s reaction to Danika’s video and check in with Spider-Man #13! Plus, your feedback! 1:42 – A cool Q&A opportunity: Brian asks Bendis about introducing the topic of race in Spider-Man #2. 8:23 – Spider-Man #13 – The challenge of maintaining momentum while shifting narrative styles. Jefferson-65 is the Scorpion…but is that not enough to carry the issue? 19:40 – Our three-word summaries of Spider-Man #13. 20:20 – Kyle Presents: Listener Feedback. What could Miles and Gwen’s kiss *really* be about? Is Miles due for a major push to tie in with his upcoming movie? We kick around ideas for worthy hypothetical successors to the writers’ chairs. Is it time for a Miles Annual? 30:57 – Outro. What did *you* think of this issue (and Gwen and Miles getting together)? Let us know! In this episode, Brian, Kyle, and Jack discuss the announcement of Miles’ cinematic debut and his first date with Gwen in Spider-Gwen #16! 0:00 -Miles on his way to the big screen! Is it a good thing that he’s walled off from the Marvel Cinematic Universe? 6:30 – Spider-Gwen #16 – Skipping the obvious while landing on what was in plain sight all along! Establishing a genuine bond between the characters. Do readers not follow crossovers anymore? A theory about the cliffhanger (hoping it’s not a spoiler, but we wouldn’t mind if it turns out to be right). 26:59 – Our three-word summaries of Spider-Gwen #16. 27:10 – Outro. What did *you* think of this issue (and Gwen and Miles getting together)? Let us know! Miles confirmed as lead for Spider-Man animated film! In this episode, Kyle, Jack, and Brian kick off the new year with a look at the crossover that was practically made for our show, as Miles meets Gwen (ahem) in Spider-Man #12! 0:00 – Intro: Never saw this coming in a million years! 2:55 – Spider-Man #12 – How does it go from Jefferson is missing to Miles making out with Gwen? Starting the new year with strongest issue in some time. A crossover handled with care: Artists having fun and a promising setup for a meaningful story. 20:28 – Our three-word summaries of Spider-Man #12. 21:22 – Outro. What did *you* think of this issue (and Gwen and Miles getting together)? Let us know! Plus we’ve got a new logo! Who knew that today’s artists cite Mortal Kombat (the 1995 movie) as an influence? Thanks to Diana for our logo! In this episode, Brian and Jack are joined by fellow Gwen fan Jordan Calhoun, writer and editor at BlackNerdProblems.com to catch up with the latest Spider-Gwen holiday story and Jefferson’s return to SHIELD, look back at the highs and lows of Gwen and Miles’ 2016, and share thoughts on their upcoming interdimensional romance. 0:00 – Intro; Welcoming Jordan. 3:56 – Spider-Gwen #15 – The holiday trilogy ends the year on a high as the series gets back on track. Evil characters kiss differently. A closer look at the “throwaway” characters. The reward of risk. Can the Gwen & Miles thing be more than a gimmick? Jordan creates an editing challenge. 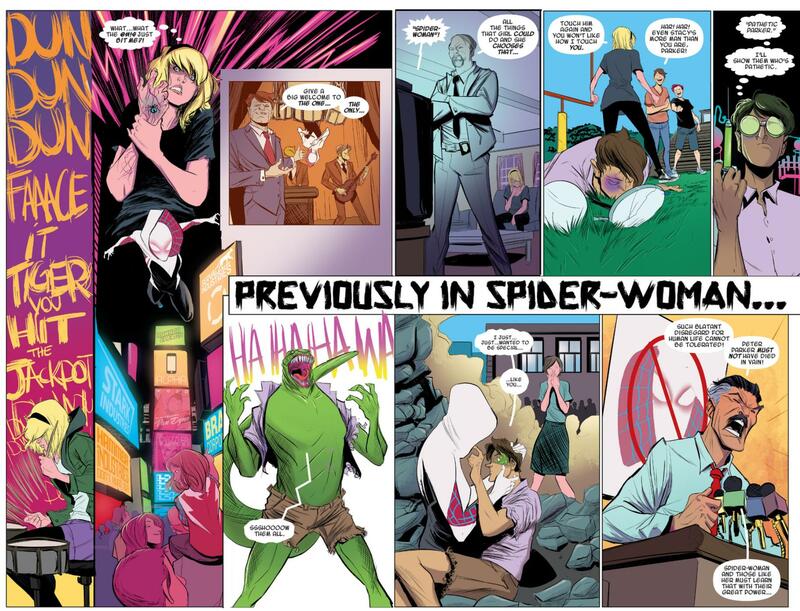 28:44 – Our three-word summaries of Spider-Gwen #15. 30:11 – Spider-Man #11 – Jack celebrates the end of crossovers as the narrative shifts to Miles’ dad in a story that leaves us feeling like we’re killing time until next month’s crossover. Stunning art from Sara Pichelli. Back on track (sort of), but were there missed opportunities? 44:25 – Our three-word summaries of Spider-Man #11. 45:40 – Overall, 2016 was a great year for both Gwen and Miles! We share our highlights. 54:21 – Outro. What do *you* think of these stories (and Gwen and Miles getting together)? Let us know! Whatever happened to Year One of the Spider-Men sequel? Thank you for listening! We’d love to hear from you: Send us your comments at feedback@ultimatespinpodcast.com! If you send us an mp3 with a comment or question, we’ll feature it in the show! In this episode, Jack and Kyle are joined by returning guest BlackNerdProblems.com’s Omar Holmon to discuss Spider-Man #10, the final tie-in issue to the never-ending Civil War II. 2:12 – Spider-Man Homecoming Trailer – Ned Leeds! 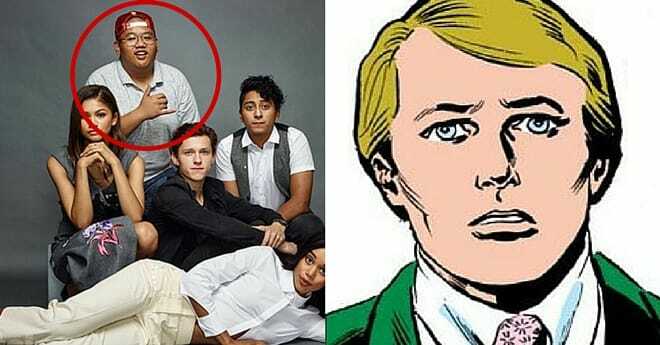 You know Ned Leeds, right? 6:35 – Spider-Man #10 – We’re finally done with Civil War II tie-ins! Omar takes recap duty. Captain Marvel is still a jerk. Do the future possibilities make up for the issue itself? 41:47 – Our three-word summaries. What do *you* think of issue #10? Let us know! In this episode, Brian and Jack talk about making the most of Thanksgiving during a year that was both tough on Earth-65 as well as the real world. Gwen’s holiday trilogy continues in Spider-Gwen #14 – an action-free issue that still manages to pack a solid punch. 1:09 – Brian’s Thanksgiving warms Jack’s cold dead heart (America is already pretty great); No virtual Kyle this episode. 26:40 – Our three-word summaries. What do *you* think of issue #14? Let us know! In this episode, Jack and Brian valiantly try to discuss the latest Civil War II crossover while Kyle is more interested in providing an elaborate breakdown of the exciting Miles vs. Venom battle that’s teased on the cover of Spider-Man 9. There’s also the bigger question…was bringing Miles into the main Marvel universe a good idea? 2:13 – Spider-Man #9: A story about people standing around killing time. Frustration with the series (although we’re ready for a Ganke solo book). The beautiful artwork: We didn’t love reading this issue, but we certainly loved looking at it. Kyle takes over to provide an extensive analysis of this issue’s battle with Venom. 16:12 – Brian’s three-word summary. Jack’s four-letter word summary. What do *you* think? Let us know! In this episode, Kyle, Brian and Jack catch up on meeting creators at NYCC, speculate on the upcoming Miles & Gwen crossover, share listener thoughts on writers’ experiences and *that* scene in Spider-Man #8, and preview next year’s Miles YA novel before discussing the spooktacular Halloween story that’s Spider-Gwen #13. 1:36 – Kyle visits New York, but did anyone understand him? Meeting the creators (and appreciating their generosity). Which guest artist is returning to Spider-Gwen? 7:32 –Miles and Gwen: The Great Romance? Or not? 11:33 –A reader shares a personal response to Luke Cage telling Miles to not screw up being a POC hero in Spider-Man #8. Would the reaction be different if we didn’t know what Bendis looked like? 19:51 –Spider-Gwen #13: A Scooby-Doo style mystery quickly goes from cool to creepy. Getting into Gwen’s head (again). Jack hates Halloween, but we all love Betty. 33:26 – Our three-word summaries (Spoiler: Brian’s is the best). What do *you* think of issue #13? Let us know! 35:58 – Outro. Want to write reviews for Superior Spider-Talk? Get in touch with the team! Looking forward (sort of) to November. Superior Spider-Talk is looking for Miles reviewers! Look who’s returning to Spider-Gwen! In this episode, Brian and Jack are dazed into indifference by Civil War II and briefly discuss Gwen’s animated debut before getting into the astonishing conclusion to Weapon of Choice in Spider-Gwen #12. 1:17 – What is going on with Civil War II? Never mind Cap, why do this to Miles? Gwen on television! 9:00 –A finale that not only delivers, but takes surprising turns as the creative team raises the bar even further. Understanding the Punisher and the core themes of the series. An issue that warrants a re-read (or two). 27:45 – Your reactions to this issue! Our three-word summaries. What do *you* think of issue #12? Let us know! 32:11 – Outro. Want to review Miles and Gwen for Superior Spider-Talk? Get in touch with the team! Clip of Gwen the Web Warrior! Kyle’s site: Nerds Unchained. Interested in writing for the site? Just let Kyle know! In this episode, Brian rejoins Kyle and Jack just in time for Miles to join the events of Civil War II. Unfortunately, we’re not exactly thrilled about it and talk about the reasons why the issue didn’t work for us. There’s also the bigger question…was bringing Miles into the main Marvel universe a good idea? 2:02 – Spider-Man #8: Two stories in one, with neither being particularly satisfying. Empty sentiments, padded scenes, not connecting with art. Will Miles always be a passive character in his own series? Why did he need to “come over” while Gwen-65 (and now 1987 married Peter) are free to do their own thing? 32:53 – Our three-word summaries. What do *you* think? Let us know! 35:10 – Outro. Want to review Miles and Gwen for Superior Spider-Talk? Get in touch with the team! Renew Your Vows: The Series! In this episode, Jack, Kyle, and Brian see how Miles survives his latest crossover event in Spider-Man #6 while Gwen teams up with her dad and Aunt May in a surreal battle against Kraven the Hunter and Louis the Orangutan in Spider-Gwen #10. 0:00 – Intro; Miles gets a new novel…and a new love interest? 21:26 – Spider-Gwen #10: Gwen’s dad is pretty cool as well, but are the villain and action scene in this chapter a little *too* out there? In this episode, Kyle, Jack and Brian are joined by BlackNerdProblems.com’s Omar Holmon for a fun and spirited conversation about the first arc, characterizations, diversity on the page vs diversity behind the scenes, and plot devices used to rush into the next event (hint: ZZZT!). 5:26 – The handling of race in this arc – was it effective or cringeworthy? Would the writer’s background change a reader’s POV on characters like Gloria being “stereotypical” vs. “authentic?” Miles goes Super Saiyan. Is there a point to personal conflicts in this series? Diverse characters are great, but what about diverse creative teams? In this episode, Brian, Jack, and Kyle take a break from the heavier stuff happening in Gwen’s main series to enjoy some short stories from an impressive all-star creator jam session in Spider-Gwen’s first annual! 0:00 – Intro; Spider-Gwen…Radioactive No More? 2:06 – “Week One”: A Wrestling Story for Kyle! 7:05 – Captain America – Politics and Prince for Brian! 13:35 – The Mary Janes in a band adventure for Jack! Coverage of Trump as M.O.D.A.A.K. Now that the crossover is done, Kyle, Jack, and Brian return to catch up with Gwen’s new status quo in the fantastic Radioactive Spider-Gwen #9. 6:35 – Discussion: How beautiful is this art? Brian has some, er, choice words. A story about loneliness and friendship. No worries for Jack the straight white guy. The evolution of Frank Castle. Considering the implications of Gwen’s weapon of choice. Kyle attempts to wrap up the episode and needs to reboot. Speculating on future villains and plot arcs. Episode 32.3: Interview with Spider-Gwen writer and co-creator Jason Latour! A special “point one” (or “point three”, but who’s counting?) episode where Brian got to talk with JASON LATOUR, the writer and co-creator of Radioactive Spider-Gwen! This was a great and truly in-depth conversation with a talented creator and a good dude – we hope that you enjoy it! HUGE THANKS to Jason for taking the time out of his busy schedule to chat with us! Brian and Superior Spider-Talk’s Tony and Jaleh welcome KYLE back to the show to wrap up the crossover extravaganza with Spider-Women Omega! An eight-part event focusing on characters vs. spectacle is an ambitious plan – does the finale stick the landing? 0:00 – Intro; Kyle is the Alpha and the Omega. 2:22 – Spider-Women Omega: Nico Leon’s cinematic style is a perfect match for an action-packed (and funny!) issue. Strong characterization for fun leads triumphs over a few narrative disconnects. A solid crossover with consequences and interesting hooks to go forward. When can we do this again (and can Earth-65 Reed Richards come back)? 25:13 – What did YOU think? Let us know! Thanks and Outro. Thank you for listening! We’d love to hear from you: Send us your comments at feedback@ultimatespinpodcast.com! If you send us an mp3 with a question or comment, we’ll feature it in the show! Brian and Jack welcome Superior Spider-Talk’s Tony and Jaleh back to the show to catch up on discuss Silk 8 and Spider-Woman 7. How does the Spider-Women miniseries fare as we head into the final chapter? 2:00 – Silk 8: Oh, it was all going so well! The miniseries slips with a shift in art, pacing, and characterization. We try to figure out how and why things didn’t work. 16:46 – Spider-Woman 7: Whew, that’s more like it! We talk about this vibrant and funny issue, our new favorite supporting character, and how this miniseries is playing with our expectations. In this episode, Jack and Brian discuss Spider-Man issue 4: A story about friendship, balls, and guided missiles. 2:27 – Discussion: Why did Ganke throw Miles a (golden) curve ball and risk everything? Looking closer at their friendship and thoughts on race and body image. The greatest eyebrows in comics. Camo mode? Miles inheriting a new/old rogues’ gallery. Apathy toward Civil War II. Kyle’s fund-raising page – every bit helps! This episode, Brian and Jack are joined once again by Superior Spider-Talk’s Tony Goodwyn to check in with Chapter 5 of Spider-Women! Radioactive Spider-Gwen #8 starring…Cindy Moon and The Sinister Silk?! 0:00 – Intro: Happy Free Comic Book Day! One lucky listener gets a free digital code for this issue! 1:56 – Jack’s back! Catching up on Spider-Women so far and our response to general Big Two event hype. Are we growing jaded…or just growing older? 10:59 – Discussion: The Cindy Show (and why that’s good for Gwen)! Did the revelation work? Digging Bengal’s character and panel design; Latour drops hints for Gwen’s future; Gwen’s freedom to break the storytelling mold? 2:36 – Discussion: Cindy visits her family (and we shrug our shoulders), then learns more about her counterpart. Wait, it’s over already? Jaleh saves you $1. 22:31 – Discussion: Fantastic on every level – Jess shines as the lead Spider-Woman for the entire event. Jaleh still doesn’t like Cindy. Joëlle Jones is awesome – Check out Lady Killer, Ultimate Spider-Man #150, and a cool Madman commission! How are the sales figures for these titles? Check out Superior $ales Talk! The Spider-Event of 2016 is here! Kyle and Brian are joined by Superior Spider-Talk’s Tony Goodwyn and Jaleh Najafali to catch up with the first two chapters of Spider-Women! How does something as simple as brunch go so colossally wrong for Spider-Gwen, Spider-Women, and Silk? Plus we announce the winner of our latest variant cover giveaway contest! 5:11 – Discussion: The event kicks off, but it’s more about character than spectacle (and that’s fantastic). Getting to know our leads, but the artwork is a surprising hurdle. 25:03 – Discussion: A surprisingly hilarious turn with outstanding art, humor, and heart. How does the idea of “family” drive each of our heroes? A very different kind of battle for our hero as Spider-Man is grounded! Kyle, Brian and Jack dig into the fantastic character moments for Miles (and Ms. Marvel!) in the fantastic Spider-Man #3! Plus there’s still time to enter our variant cover giveaway contest! 3:09 – Miles vs. his grandmother: Navigating family dynamics; Why Miles and Kamala are a perfect combination (on a few levels); The Black Cat is ready for her close-up; Incredible art and the power of silent panels; More meta-commentary; Don’t mock the Shocker! Spider-Woman vs. The Green Goblin! Things don’t go the way you might think. With Kyle away this week, Brian and Jack take an in-depth look at how Great Power and Great Responsibility are revisited in Radioactive Spider-Gwen #6! Plus it’s time for another variant cover giveaway contest! What happens when the world discovers that the new Spider-Man is not a white guy? And what does Miles think of the reaction? Brian, Kyle, and Jack take a look at race, identity, validation, and venom stings in Spider-Man #2! Plus we share your feedback and announce the winners of our variant cover giveaway! 3:33 – Spider-Man meets Spider-Man: Does Miles need Peter to validate him every time? 6:44 – Blackheart + Zzzt = Yawn. Could Miles beat the Avengers? 21:56 – That cliffhanger! Gulp. 32:36 – Listener feedback: Passing the torch? Episode 26.1: Interview with Spider-Gwen colorist Rico Renzi! A special “point one” episode where Kyle and Brian got to talk with RICO RENZI, the colorist of Marvel’s Radioactive Spider-Gwen and The Unbeatable Squirrel Girl! In this episode, we talked with Rico about the increasing awareness of colorists as part of a creative team, adapting his approach for different artists, why he prefers print to digital, his favorite moments from the series so far, and a teaser hint or two on what’s coming up for the series. Rico also hooks Kyle up with some comic book recommendations! HUGE THANKS to Rico for taking the time out of his busy schedule to chat with us! Thank you for listening! We’d love to hear from you: Send us your comments at feedback@ultimatespinpodcast.com! Record it as an mp3 and we’ll feature it on the show! Brian, Jack, and Kyle are back to catch up with Radioactive Spider-Gwen #5! Just one question: Where’s Gwen? 2:36 – A guest artist! How does Chris Visions’ style work for the series? Considering impact of colors and letters. 14:12 – Gwen is MIA, but can the other characters carry the issue? We love Dad Cop. Is Harry a real threat? Cap is awesome (and so is Frank). 28:21 – Three word summary (about the issue, not Kyle). 31:36 – Giveaway Contest! Tell us what you think of the Venom Sting and win a variant edition of Spider-Man #1! The moment has finally arrived! Brian, Kyle, and Jack check out Miles Morales’ long awaited (third) debut in Spider-Man #1! Plus enter to win a special variant cover edition! 13:00 – Miles’ parents, racial politics, and addressing his mixed heritage and minority experience: Is now finally the right time? 20:25 – Spider-Man vs. Blackheart: Is the Venom Sting too much? Kyle and Jack learn about the classic If This Be My Destiny. 35:31 – Giveaway Contest! Tell us what you think of the Venom Sting and win a variant edition of Spider-Man #1! 2016 hits the ground running! Brian and Kyle are joined by guest Jack Chambers of the Inter-Comics Podcast to start the year off with Radioactive Spider-Gwen #4. 1:58 – Radioactive Spider-Gwen #4: Beautiful art and great character ideas, but are things moving too fast? Or is it up to us as readers? Does the method of how we read it (physical vs. digital) affect the rhythm of the issue? Costume design: The eyes have it. 1980s television and is Kyle right? 39:23 – Listener feedback: Can Miles and Gwen become better known with non-comic book readers? How do you read Radioactive Spider-Gwen (or comics in general) – physical or digital (phone, tablet, computer; Guided View or full-page)? How long do you spend reading and do you read it more than once? Let us know! Brian, Kyle, and Nour see the year out with Ultimate End #5. Last one out, get the lights. 2:38 – Ultimate End #5: Not entirely bad, but way too late. What worked? What didn’t? Discussing Miles’ new status quo. 18:15 – Listener feedback: RIP Ultimate Universe. Long live Earth-65? 1:28 – Radioactive Spider-Gwen #3: Recap challenge fail. Why 616 already? Making the most of the moment. Those bios at the end – too many words in a comic book (?!). Does “of” count as a word? With Kyle away at Thought Bubble, Brian and Nour mess with the show format, catch up on recent news (GANKE LIVES! ), discuss the new hero in Gwen’s world, and witness the beginning of a new era. Plus, we announce the winners of the Radioactive Spider-Gwen variant giveaway! 7:22– Radioactive Spider-Gwen #2: Crazy. And. Fun. 23:36 – All-New All-Different Avengers: Sam vs. Kamala! And oh yeah, Miles is in it. 33:46 – Contest! Your feedback and the winners! More Kyle (and Nour!) at Nerds Unchained. Interested in writing for the site? Just let Kyle know! We’re back! Brian, Kyle, and Nour review upcoming books for both Miles and Gwen and discuss the first issue of the new Radioactive Spider-Gwen series (and attempt a live remix of her theme tune). We’re also giving away two variant versions of issue 1! Listen to the show to find out how to win one of these books! Gwen, Cindy, and Jessica team up in next year’s Spider-Women crossover event! In this episode, we’re joined by Superior Spider-Talk‘s Dan Gvozden as we take one step closer toward the end of Ultimate End and look back at a more successful miniseries, 2012’s Spider-Men. 10:21– Ultimate End #4: Fantastic artwork, Hawkeye confusion, Death of the one-shot? Why is any of this happening? 29:50 – Spider-Men: A true success and the Ultimate entry point for new readers! Episode 18.1: Interview with Spider-Gwen co-creator Robbi Rodriguez! A special “point one” episode where we got to talk with ROBBI RODRIGUEZ, the co-creator of Spider-Gwen! It flew by quickly for us, but we covered a lot of ground! In this episode, you’ll learn about Robbi’s early influences, the beginnings of his career (including how he met fellow co-creator Jason Latour), and his creator-owned work Frankie Get Your Gun. We discuss how Spider-Gwen ended up in the unique position of resembling a “creator owned” book at a major publisher and got the inside perspective on how much music really influences the series – not just in terms of its style, but how the team works together to plan and create each issue! We also found out his favorite moments from the series so far, setting up “ground rules” for other writers to follow, and got some cool hints on what’s in store for “season two” this Fall! In this episode, we take a look at the teasers for the All-New All-Different Spider gang and brave the mess that is Ultimate End. 1:15 – Hellos; Hints about the Spider gang in the All-New All-Different Marvel previews. 13:47– Ultimate End #3: We’re trying. Really. Please send help. 26:15 – Listener feedback: Going retro? We want to give you free digital comics! All-New All-Different Marvel preview magazine – FREE at Comixology! In this listener request episode, we take a break from the Secret Wars and get to know Cindy Moon, aka Silk! Plus, we talk about the exciting news that Bendis and Pichelli are reuniting on a brand new series for Miles! 1:32 – Miles Morales returns this fall! How can All-New All-Different Marvel handle (at least) four Spider-characters? 7:04– Silk #1-5: Making the most of a rough start. Our impressions of the character and series so far. Superior Spider-Talk: Miles Morales is Spider-Man! Reviews for Silk at Superior Spider-Talk! We’ll be back next month to catch up with Miles and Gwen in Secret Wars! Meanwhile, we’d love to hear from you! Don’t be shy, drop us a line at feedback@ultimatespinpodcast.com! This month, we welcome guest co-host Jack Chambers of the Inter-Comics podcast for a fun extended episode! Lots to catch up on this month with alt-Spidey news, plus we get our socks rocked by Spider-Gwen #5 and check in on Battleworld with Secret Wars #3, Ultimate End #2, and Spider-Verse #2. We also announce our contest winner! 0:00 – Kyle kicks things into gear (sort of). 20:54 – Spider-Gwen #5: Gwen bids adieu (for now) and goes out with incredible style. 40:55 – Secret Wars #3: Hey, it’s Miles! 47:35 – Ultimate End #2: Why? 58:42 – Spider-Verse #2: Gwen joins a new band. 1:05:52 – Contest winner! Appreciating your support. Kyle breaks character (gasp!). 1:11:08 – Thanks, contact info, and farewells. More Jack Chambers at Inter-Comics Podcast! PLEASE CLICK HERE FOR OUR iTUNES PAGE TO LEAVE A REVIEW (and win free Marvel digital comics)! You asked, we listened: We’ll be back later this month to catch up with Silk! Meanwhile, we’d love to hear from you! Don’t be shy, drop us a line at feedback@ultimatespinpodcast.com! Nour, Kyle, and Brian try to crack the mystery of Ultimate End (it doesn’t go well), and distract themselves with an alternate take on an alternate Spider-character. Listener poll: How are we doing and what would you like to hear on the podcast? Plus your comments and a reminder of our super prize giveaway (it’s not too late and it’s super easy, check it out)! 0:00 – Previously, on Ultimate Spin. 1:10 – Hello listeners! What would you like to hear on the show? Enter our iTunes review giveaway contest! 7:29 – Spider-Gwen news: Unlock new music from The Mary Janes! Spider-Gwen merch is here! 10:15 – Ultimate End #1: Slow burn or crash and burn? 25:57 – Spider-Verse Secret Wars #1: Alternate version about an alternate version of an alternate version. Zed. 36:38 – Listener Feedback: Your thoughts and theories about Ultimate End. 42:49 – Thanks, contact info, and farewells. Kyle’s website: Nerds Unchained. Interested in writing for the site? Just let him know! PLEASE CLICK HERE FOR OUR iTUNES PAGE TO LEAVE A REVIEW! We’ll be back in June to catch up with Spider-Gwen. Meanwhile, we’d love to hear from you! Don’t be shy, drop us a line at feedback@ultimatespinpodcast.com! Kyle, Nour, and Brian wonder about Spider-Gwen’s future, shrug their shoulders at Secret Wars, and look for clues in Miles’ debut in All-New All-Different Avengers. We also discuss the best issue of Spider-Gwen yet while the fate of the podcast hangs on the soccer football scores. Plus listener feedback and our first contest! What’s in the box…and how can you win it? And can Manchester United save the day? 1:15 – The end of Spider-Gwen? Secret Wars: AHHHH!!! Miles Morales: Avenger. And a new song by the Mary Janes! 9:42 – Spider-Gwen #4 is a skillful blend of heart and soul. “Bonjour ! Ça va ? Poulet.” Brian’s transatlantic jinx. Fear of an Evil Ben Parker. 30:14 – Listener feedback: Your thoughts on Miles Morales #12. Why bother with Secret Wars? Rethinking Silk. 40:35 – The Ultimate Spin Contest! What’s In The Box?!? We’d love to hear from you! Thoughts on Gwen’s story so far, the Ultimate End, or our adding Silk to the mix? Don’t be shy, drop us a line at feedback@ultimatespinpodcast.com! In this special “point one” episode, Brian’s eight year old son Adam discovers Miles’ origins in Ultimate Comics Spider-Man Vol. 1 (issues 1-5). We’d love to hear from you! Don’t be shy, drop us a line at feedback@ultimatespinpodcast.com! Nour, Kyle and Brian are joined by Dan Gvozden, founder of Superior Spider-Talk and co-host of the Amazing Spider-Talk podcast to talk about Miles Morales #12, challenges for the series, and abandoned plot threads across the entire history of Ultimate Spider-Man. 1:48 – Miles Morales #12: What happened? Challenges for Miles as a character and a series. Are big crossover events worth it? And some All-New Ultimates PTSD. Have faith, True Believers! The story goes on and we’ll be back to talk about Ultimate End, Miles’ FCBD Avengers debut, and Spider-Gwen #4! Nour, Kyle and Brian are back to review Spider-Gwen #3 and talk about plans for the future. 1:16 – Spider-Gwen #3: Continuity glitches? The Vulture has a lot of gas. Nour needs glasses. 24:02 – Listener feedback: What’s next for us? Should we talk about Silk? We’d love to hear from you! Thoughts on Gwen’s story so far or the upcoming Miles finale? Don’t be shy, drop us a line at feedback@ultimatespinpodcast.com! Nour, Kyle and Brian discuss the major news: Miles Morales will be joining The All-New, All-Different Ultimates Avengers! Plus some listener comments about Spider-Gwen’s imaginary friend, favorite Ultimate Universe characters, and a surprising confession from one of your hosts. 1:16 – Miles is an Avenger! Too much too soon, or the perfect way to (re)introduce him? And Kyle is right (again). Superior Spider-Talk: Miles joins the Avengers! Free Comic Book Day is May 2, 2015! We’d love to hear from you! Thoughts on Miles as an Avenger, the upcoming finale and his future in the new Marvel Universe? Don’t be shy, drop us a line at feedback@ultimatespinpodcast.com! With Nour on vacation, Kyle and Brian are left on their own to talk about the penultimate chapter of the Miles Morales story and a weird turn in Gwen Stacy’s new beginning. Images from Miles #11 and Miles #6: Have we seen this room before? We’d love to hear from you! Thoughts on the upcoming Miles finale and his future? Who should be in Felicia Hardy’s Black Cats for the inevitable Battle of the Bands? Don’t be shy, drop us a line at feedback@ultimatespinpodcast.com! Episode 10.1: Interview with Miles Morales artist David Marquez! A special “point one” episode where we get to hang out with the one and only DAVID MARQUEZ, the artist who brings Miles Morales to life! We learn about David’s early influences, how he landed the Ultimate Spider-Man gig, his growth as an artist through the series, and talk about his first creator-owned project, The Joyners In 3D! We also get his take on Miles in the movies and hints about what’s in store for him as Miles Morales: The Ultimate Spider-Man gets ready to wrap up in April. 54:25 – Miles in the MCU? And also be sure to check out The Joyners In 3D from Archaia! HUGE THANKS to David for making the time to chat with us! If you can, please take a moment to leave us a review! Thanks for listening! If you like what you’re hearing, please spread the word! I just posted something over at Superior Spider-Talk about the response to the suggestion that MCU Spider-Man could break from the norm and open up casting to a wider range of people. I’d love to know what you think – you can always write via our contact form (or e-mail feedback [at] ultimatespinpodcast.com), Facebook, or Twitter and we’ll share your notes on the show. Thanks for reading! 1:41 – Spider-Gwen #1: Gwen rocks! Ultimate MK II? The spectre of Secret Wars: How long can this good thing last? A humble request: If you can, please take a moment to leave us a review! In this episode: Miles Morales #10 reminds us how fun Spider-Man comics can be, we share some listener feedback about Miles’ future in the new Marvel continuity, talk about how Miles might work in the MCU, and Kyle takes us through the solicitations for the final issues in the Miles Morales series. Okay, we’re a little nervous too. 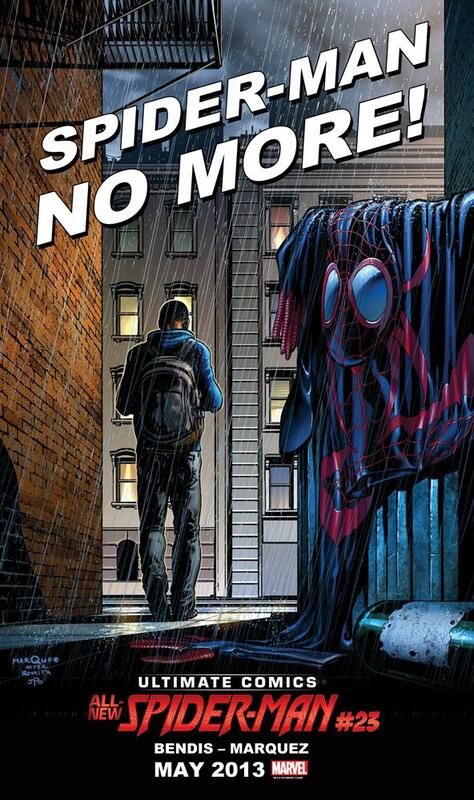 1:58 – Miles Morales #10: Miles IS Spider-Man (and it’s a blast). Those guys look familiar. Hail Hydra. Ganke-Verse. 25:24 – Listener feedback: Is Miles’ future as a character in jeopardy? When and how could he work in the MCU? 40:50 – Solicitations with Kyle (it’s been a while). The beginning of the end? In our second of two episodes this month, we try to make sense of the mysterious “The End” solicitation for April and the Secret Wars announcement, check in with Miles and his dad in Miles Morales #9 and bid a fond farewell to the All-New Ultimates with issue #12. 1:51 – Is Miles’ series ending (again)? Can his character work in a redefined Marvel Universe with more than one Spider-Man? And what about Spider-Men 2? 28:13 – All-New Ultimates #12: Goodbye and good riddance. Can Miles work in a team book? A special “point one” episode where we talk about Gwen Stacy, the star of Spider-Gwen, the new series by Jason LaTour and Robbi Rodriguez! With All-New Ultimates wrapping up, Ultimate Spin will start following Gwen’s adventures starting in February! Wrapping up 2014 as one story gets ready to end and another is only just beginning. And some changes for our show in 2015! 1:47 – All-New Ultimates #11: Things happen. We try to figure out what they mean (again). 26:56 – Miles Morales: Ultimate Spider-Man #8: An unconventional issue about Miles’ dad. TL;DR: It’s awesome. Kyle scored this great print from Phil Buckenham at Thought Bubble. November brings some crossover events, some hints about Miles’ future, and the beginning of an end. 1:34 – The End of the Ultimate Universe? Taz is not a moron. Kyle declares allegiance to Team Mephisto. Spider-Verse kicks off. Inching forward with All-New X-Men #33. 56:30 – All-New Ultimates #10: Stop the bus! And hey, it’s Jeff. 1:27:58 – Listener feedback: Fun with lists. Dream teams. Welcome back! It’s time to catch up with Miles and his Amazing Friends in All-New Ultimates #9 and finally get some answers from Peter Parker in Miles Morales: Ultimate Spider-Man #6! We also answer your questions and have one or two for you in return. 1:37 – All-New Ultimates issue 9: Scourge. Mayhem. Jeff. 35:01– Miles Morales: Ultimate Spider-Man issue 6: What Makes A Good Man? Oh, and Kyle was right. 1:15:09 – Listener feedback: Kyle is still right. Where can things go next? And a homework assignment from Nour. Double-shipping this month, we’re back with a look at the highly anticipated Miles Morales: Ultimate Spider-Man issue 5. We also check out the beginning of a crossover arc with the All-New X-Men, answer some questions from our listeners, and talk about the solicitations for upcoming Spider-books (possibly exasperating Kyle in the process). 1:45 – Miles Morales: Ultimate Spider-Man issue 5: Worth the wait? 51:58 – Listener feedback: The Spider-Twins, Miles’ Gallery of Rogues, and where’s Jessica? 1:12:00 – Gwen Stacy rocks!